Barry Commoner's 1971 book The Closing Circle: Man, Nature and Technology attempted to explain the causes of and solutions for environmental degradation in modern society. The "closing circle" was his metaphor for the connection between humans and the natural ecosystem. Commoner argued that there were three possible causes of environmental degradation: human population growth, increasing affluence, and modern technology. He concluded that modern technology was the principal cause of society's environmental problems. This opinion put him at odds with Paul Ehrlich, who had argued in his 1968 book, The Population Bomb, that human overpopulation was the principal cause of environmental problems. (1) everything is connected to everything else; (2) everything must go somewhere; (3) nature knows best; and (4) there is no such thing as a free lunch. Commoner has generally favored leftist political causes and, in 1980, he ran for U.S. president on the Citizen's Party ticket. He has been the recipient of eleven honorary university degrees and has served on the boards of numerous environmental and antiwar organizations. 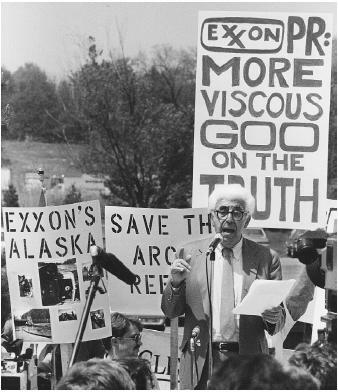 On May 30, 1997, a symposium titled "Barry Commoner's Contribution to the Environmental Movement" was held in honor of his eightieth birthday. SEE ALSO E HRLICH , P AUL . Hall, Alan. (1997). "Barry Commoner: A Leading Environmentalist Reviews His Long, Contentious Past and Sets New Directions for the Future." Scientific American . Available from http://www.sciam.com/interview .